As promised, this is a post about the physical therapy I’m doing to rehab my knees. My hope is that this Runner’s Knee isn’t a permanent fixture in my life. I know a lot of runners suffer from this and other ailments. I think as a whole all of us could stand to do some strengthening exercises to prevent injuries. I clearly neglected certain parts of my body which led to this current situation (don’t ask me how, I still think it’s weird that all the strength training I did didn’t strengthen the muscles around my knees). As with every injury I’ve had in the past, I’ve learned how to work around it so I could still be active. This post is about a recent workout that I’ll use as an example of how even while injured, I can still get a quality sweat in and I’ll also share the PT I’m doing. I started with the bike, very light resistance, and did about 15 minutes of it staying within 80-95 rmps, as the doctor ordered. I felt really good and like I could keep going but I didn’t want to push it so I stopped after 15 minutes. I’m glad I took it easy on the first day so I can continue to do it more often. And boy did I feel it! I did 30 minutes of the ab exercises and about half way through they were shaking with every move. The next day they were sore, and the day after that! Intense! After the ab exercises, I hit the machines for some upper body exercises (arms and chest mostly). This is for quad strengthening. I rest on my forearms and tighten the inside of my thigh muscle, with opposite knee bent. I life my straight leg 8-10 inches from the ground, keeping the leg straight. My doctor wants me to work up to 75 repetitions! Right now I can do 3 sets of 10 repetitions. And I definitely feel them. Eventually I’ll add some weights to my legs. This one is fairly easy for me. It’s a stretch I already do after running. Pull the foot back until the stretch is felt in the front thigh. This one is weird. I’m supposed to stand, cross one foot over the other and then bend, except when I do it I don’t feel anything. I need to ask the physical therapist about this one. There is an alternative IT band stretch that I’ve been doing and like a lot. You lay flat on the ground and use a strap or jump rope to assist in the stretch. I put one fit in the strap and with leg straight, stretch it over the other leg with it slightly raised. I definitely feel the IT band stretch with this one. I already do this one in my stretching repertoire. This is just like the other straight leg exercise but I’m laying flat on the ground and I’m supposed to turn one leg out while I lift it. Also, the other leg is flat on the ground. This one is a lot harder to do than the first leg raise. This one is also easy for me. I could do 50 of these before I feel anything. I lay on my side with the leg that’s on the ground bent, then the top leg is straight. I tighten my thigh muscles and lift the leg. Doctor’s orders: 10-20 times per side and 1-2 sets each session. This one is fun but a challenge. I can barely do two in a row. It’s similar to the above hip exercise except with this one, the leg on the floor is straight, the top leg is bent over it and the leg underneath is the one I raise. It’s HARD. It hurts! 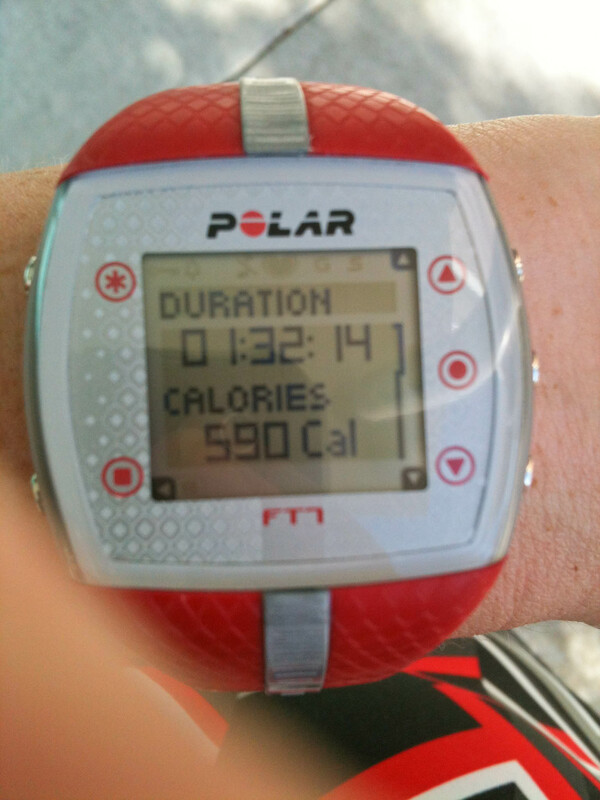 Despite not being able to run, I still got in a great workout. I worked my abs, I did all of my physical therapy exercises and I also had time for the weight lifting machines. I am no stranger to injury and while it’s very maddening and if you’re like me and lack patience…being sidelined for a long time is frustrating. But try and find ANY activity that you can do to stay active. It will definitely help your mood while you recover! QUESTION: Have you seen a physical therapist for an injury? What improvements did you see with the exercises? I like the sound of those Crazy Ivans! They are a lot harder than they look! Thank you, Michelle! I hope it gets better soon. It’s been almost a month of discomfort and pain. 🙁 I got an x-ray of my knee this morning per my doc. Hopefully I hear something soon. I forgot about pigeon pose. That’s a great one! I’ve seen a physio for my back and my shoulders. I get major muscle pain in my back and a few months ago it didn’t go away for a couple of days and suddenly I could hardly move or function. Basically, I don’t work my abs enough and don’t have enough core strength so when I do ab exercises or things that require core strength I put pressure on my back, which hurts it. So it’s a bit of a vicious circle. He gave me some great exercises to do when that muscle pain starts to nip it in the bud, and smaller exercises to do to work my core. Then two weeks ago at the gym I was with my PT doing a fly, on an incline bench, and i felt myself getting ‘wonky’ in my form and thought screw it, i’ll just force myself back up and do it again properly. That ‘wonky’ feeling and pushing the weights back up was my shoulder slipping out of its socket!! It didn’t hurt (apparently i’m quite flexible) but it’s a sign of weakness and my PT told me to go check it out, and he was pleased she sent me, and he wrote her a letter explaining what to do and what to avoid and she was impressed with him; so everyone is happy! It’s great to find and have a good physio. Can you share some of your exercises he gave you? For me, when I have back pain it’s usually related to not working my core (like you) or my hamstrings are really tight–which can happen a lot for me. My boyfriend Michael suffered from horrible, crippling back pain for nearly 2 years. He did physical therapy and stretches, we got massages, I tried to get him to do yoga to see if that helped, he went to the chiropractor weekly.In the end, what cured his back pain was starting kettlebell workouts! I’ve had to do some of those exercises. My runner’s knee seems to come and go. I hope that you can get completely healed. Diane, fit to the finish recently posted..Are You Concerned About The Safety of Your Food? I’m sorry to hear about your experiences with the condition, too. What causes your flare ups?